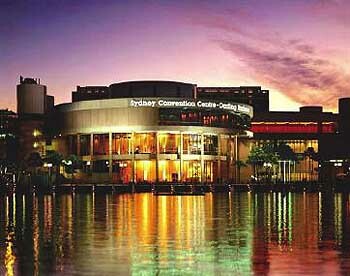 The fabulous Darling Harbour Convention Centre in Sydney was the venue of the Australian Labor Party's 2004 National Convention. Lindsay Tanner was a prominent and competent Minister for Finance and Deregulation from December 2007 under Kevin Rudd's government. He entered politics in Prime Minister Paul Keating's last government term in 1993, having won the seat of Melbourne. He left politics in 2010, and his resignation ensured Adam Bandt won the Melbourne seat for The Greens. Lindsay Tanner was and is a member of Labor's Left faction. Lindsay Tanner: 30 January 2004 - I am proud to second the Labor for Refugees amendments because I don't just want to see an end to the Pacific Solution and kids growing up behind barbed wire. I want to see an end to innocent people being locked up in the middle of nowhere and I want to see an end to our discriminatory refugee processing system where claims are determined more by the mode of transport an asylum seeker used to come to this country than their actual merits. We should never forget what this issue is ultimately about. It is about racism, about racial prejudice, about racial discrimination. Racism is a word that is perhaps sometimes too easily bandied around. But this shouldn't distract us from what it means. Racism is evil, it goes to the heart of a person's being, and it is the absolute opposite of a fair society built on good relationships and harmonious, tolerant communities. It is the opposite of opportunity for all. When I was a kid a young Hong Kong Chinese man came to Orbost to work with my father for a couple of years. I got pretty friendly with him, and he taught me a lot. He was a devout Catholic, and I found out years later that he used to sit in church crying, praying, "God why did you make me yellow?" That was Australia in the 1960's. That's the Australia I come from. That's the Australia we all come from. My Chinese friend came back to Australia nearly thirty years later. He was now a multi-millionaire, and I was a Member of Parliament. And you know what the first thing he wanted to talk to me about was? The humiliation he suffered as a Chinese man getting into, and living in, Australia in the 1960's under the White Australia Policy. I was proud to be able to tell him that I represented an electorate with thousands of Chinese-Australians. And why was I able to tell him that? Because in the decades since he lived in Australia, our national leaders from both sides of politics displayed great vision and courage by gradually pushing Australia towards becoming a non-racially based society and by not fostering racial divisions for political gain. From Harold Holt's initial steps to wind back the White Australia Policy to Gough Whitlam's ending of White Australia to Malcolm Fraser's acceptance of Vietnamese refugees and entrenching multiculturalism to Bob Hawke's acceptance of the Chinese students and strong advocacy against racism to Paul Keating's engagement with Asia, our national leaders have displayed the foresight and strength to open Australia to the world and avoid exploiting racism for short-term political gain. All that came to a shuddering, grinding halt with the advent of John Howard. There's been a bit of parlour debate recently about whether or not john Howard is a racist. I think that debate misses the point. He's worse than that. He's someone who deliberately fosters racial tensions and exploits racist attitudes for political gain. To me one of the most appalling acts of the Howard Government's brutal approach to asylum seekers has been the constant group vilification and guilt by association directed at whole categories of people, based effectively on their shared race or religion, and built on the alleged misdeeds of a few individuals. Whether it has been the children overboard lies or the claims about asylum seekers sinking boats, whole groups of people have been stigmatised. I believe this debate within the Labor Party is a debate among friends, and we are making serious progress on the issue. Whatever the outcome of the debate, I want our party to commit to a single clear objective. Never again will Australia have a government which seeks to divide people on issues of race. Never again will we have a government which deliberately vilifies groups of vulnerable people. Never again will we have a government that uses lies to inflame hated in the community. And in pursuing this commitment, Labor will not hide behind debates about technicalities, and we will not use ambiguous slogans that mean all things to all people. We will have a clear, unshakable commitment to a fair and descent Australia, where we will never again see that young Chinese bloke sitting crying in church because of the colour of his skin.